Please make sure you have the latest version of the El Fili virtual book, which you can download immediately. The new version is vb2 (elfili2009vb2.exe), so if you are unable to open vb1, please try vb2. Some people have been asking if they can get help in El Fili for free. Well, ElFilibusterismo.com does provide some notes and learning aids for free. For example, you can view a Powerpoint slideshow for Kabanata 7. In other cases, you have free access to some chapter mindmaps. There’s even an online quiz for Chapter 1, if you want to test whether you have retained the key points of that chapter. You’ve probably heard of the famous Momoy Palaboy. You’ve even probably watched some of their YouTube videos. But did you know that one of the characters in El Filibusterismo is also named Momoy? Momoy is the fiance of Sensia. You’ll find a list of some of the El Fili characters in Chapter 37 when you view the mindmap. Just remember to click on the mindmap to see the larger image. Thanks! El Fili in Tagalog Audio? Are you interested in the Tagalog version of El Fili chapter summaries (buod ng mga kabanata) in audio format? If you’re wondering why we don’t simply come out with the text version, let’s just say that some educators are concerned about the possibility of copy/paste. So if it is in audio format, at least you will take the time to listen, form your own thoughts, and then write your own insights about the El Filibusterismo. So for those of you looking for the Tagalog version of the El Fili notes, please send feedback if audio is good enough. Thanks! See the comments about the video. Here’s a sample quiz for Chapter 1. It helps if you first review the summary of Chapter 1. It’s a sneak peek, or a preview of what will eventually be added in the other online chapter notes. The El Fili virtual book will contain the summaries in text format, while the online notes will be in multimedia format (i.e., flash slideshows, mindmap images, online quizzes, audio/video presentations). At the end of the quiz (last question), you will see a Submit button. That’s what you click if you want to find out your score. 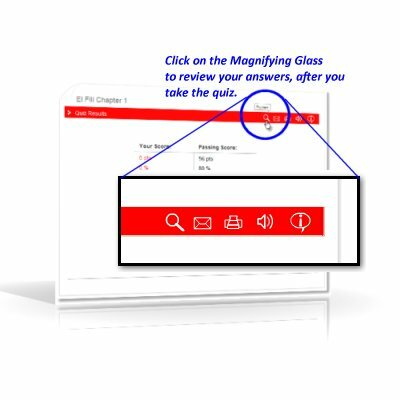 After you submit your answers (no, these won’t go to me; they’ll just go to the quiz script for score computations), you will see a magnifying glass. Clicking on the magnifying glass allows you to review your answers. You will see if you answer was correct or incorrect. You will also see what the correct answer is, to help you memorize certain events in the chapter. Feel free to take the quiz again at a later date, because the questions will be shuffled. The sequence of the multiple choice answers will also be shuffled, to prevent the case of “memorized location syndrome” which afflicts some people who take online quizzes.